Hyderabad: It’s thanksgiving time for Telangana Chief Minister K Chandrasekhar Rao and the god-fearing leader is set to leave the state’s exchequer poorer by around Rs 6 crore. KCR, as he is popularly known, is organising the Ayutha Chandi Yagam, to propitiate the gods. He had vowed to perform this religious ritual if the Telangana state came into being. The invitees include, among others, President Pranab Mukherjee and Andhra Pradesh Chief Minister N Chandrababu Naidu. Besides this ritual, the TRS leader has made several other promises to deities at different places. These include an ornament for Lord Venkateswara in Tirumala, a golden crown for Warangal deity Bhadrakali, a golden moustache for Veerabhadra Swamy in Kuravi temple of Warangal district, a golden nose stud for Padmavathi in Tiruchanoor (Chittoor district) and another for Kanakadurgamma in Vijayawada. In April this year, KCR had a chadar presented at the Khwaja Moinuddin Chisti dargah in Ajmer along with a nazarana of Rs 2.51 lakh. There’s nothing secretive about these though. The government has made it official. The state government has sanctioned Rs 5.59 crore for this purpose. However, the entire cost of Ayutha Chandi Yagam - around Rs 4 crore - would be borne by KCR himself. The five-day ritual, which begins on 23 December, will be performed at his farmhouse at Erravalli village in Medak district. KCR, a strong believer in vaastu, has already made several modifications to the chief minister’s camp office and the state secretariat, and had the IAS Officers’ Association building razed for reconstruction for not meeting vaastu requirements. He firmly believes that the yagam would ward off evils plaguing the state. The show of superstitious belief comes at a time when the state is reeling under drought, farmers are committing suicides, and there’s acute water scarcity in several districts. Soon after the triumph in Warangal Lok Sabha byelection, KCR had held a press conference where he told the presspersons that he had paid advances for electricity and other services to the state government for the Chandi Yagam. He confirmed the participation of President Pranab Mukherjee on 27 December. He has also extended an invite to Governor ESL Narasimhan on. 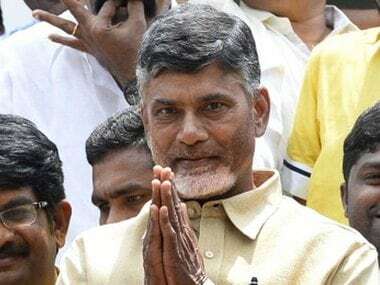 He would personally meet Chandrababu Naidu today to invite him. He had said, “I have vowed to perform the Ayutha Chandi Yagam, once the separate Telangana state is formed. I am now fulfilling the vow. And, I am bearing the expenses from my pocket and not taking anything from the state.” Though the chief minister is bearing the expenditure for the yagam, the spend on VIPs, including the president, governors and chief ministers, would naturally be passed on to the state exchequer. This won’t be a small amount for a cash-strapped state. Nation secretary of Communist Party of India (CPI) Suravaram Sudhakar Reddy told Firstpost:”None of the chief ministers or any ruler has been saved by magnums and yagams. They should get popular support. These activities show the insecurity among the rulers. They want to muster popular support by invoking religion or God. I have no objection to religious beliefs. Though KCR has asserted that he is meeting the expenditure from his personal expense, it still costs the exchequer heavy. If the president and several chief ministers attend, a lot of police force will have to deployed. Doesn't it cost huge money?" How would the Ayutha Chandi Yagam be performed? Elaborate arrangements are being made for the performance of yagams in 100 homa gundams (holy fireplaces) where 1,500 ritviks would recite the ‘sapthashathi paarayanam’ for 10,000 times for five days and Chandi ‘navakshari japam’. On the last day, sets of 11 pundits would perform homam at every fireplace with payasam (a milk preparation), and 100 pundits would recite ‘paaraayanam’ (10 multiples of 1,000 tarpanams) and offer purnahuthi (burning of all the material used for the yagam) at the grand finale. Arrangements for food and stay of the pundits and others at the yagam site, which is spread over 40 acres on the western side of the farm house of the chief minister. Multiple makeshift dining halls and dormitories, including toilets, are being built at the site. Separate galleries are being erected for VIPs and common people to sit and watch the yagam.